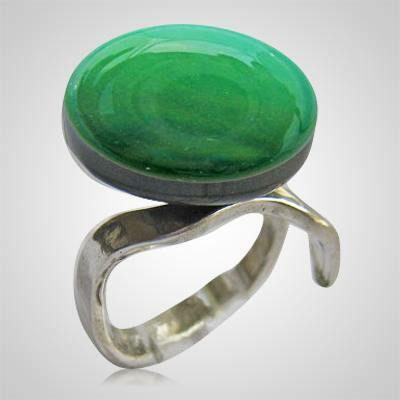 The Emerald Memorial Ashes Ring is made from dyed glass. The stunning bead is mounted on a beautifully contemporary sterling silver base. The base is adjustable and will fit most ring sizes. The ashes are hidden in the bead for an elegantly discreet memorial. "We were trying to match a pre-existing urn. Our first purchase wasn't what we were looking for but the customer service associates worked very hard to find the PERFECT urn. We sent them pictures and they searched the warehouse and found us a great match to what we were looking for. Should the need arise; I would go to this website first without hesitation. Their selection is great, their customer service is excellent, and their prices are at least half of what a local funeral home nearby charges. I couldn't be happier with my experience and would love to assure any or all future customers that these folks are the best you will find! Thank you so much!"